I used to walk past the Anna Sui makeup counter without stopping to check their products out. I’m not saying that its badly laid out, in fact, Anna Sui counters have to be one of the prettiest counters around with the signature Anna Sui delicate vanity table look to them in signature Anna Sui black and purple. However, one day I stopped to check out Anna Sui eyeshadow singles. Mine come in the old packaging which was a screw top container. It was quite a hassle so they have since changed the packaging to that of a flip top container. However the rose pattern and the signature Anna Sui rose fragrance still permeates. Yes, Anna Sui eyeshadows have a fragrance. Its quite strong but goes away after a spell. If you are sensitive to fragrance or have sensitive skin, you might want to stay away from these or at the very least proceed with caution. The rose pattern on the surface is very cute. It makes it look very girly and delicate. Pigment wise, I’d say its fair. The colours don’t go on strong but they aren’t that sheer too. I find that the colours are soft in that they don’t jump right out at you, which is how I like it and which actually makes it good for wearing to work! I can get away with wearing the lilac by itself with eyeliner and mascara even for more serious work days and I use the matte peach shade as a blush sometimes. One problem I find is their names. Like many Japanese brands, Anna Sui uses numbers instead of names for their eyeshadows. It makes it hard for me to remember which I have and which to recommend! I find that Anna Sui eyeshadows aren’t like other Japanese brand eyeshadows. They have less shimmer and the texture isn’t as soft as other brands. I really like them actually. Despite the girly look to the eyeshadow case and the rose embossed on the surface, I actually feel that it has a more adult image compared to say, Coffret D’or or even Lunasol both of which tend towards shimmer. I think Anna Sui eyeshadow singles are about RM75 each. That’s about the price of department store cosmetics anyway so I’d have to say its fair. The colour selection is quite large so I’m sure you can find a colour there to suit what you want. Anna Sui eyeshadows (both old packaging and new packaging) are also available on StrawberryNET.com . Look out for specials there! Nikki: Yes, this line has nice stuff without over the top shimmer. The damn rose imprint is the reason why I have this Anna Sui compact powder from a bajillion years ago! Everytime I’d open the compact, I would swipe ever so lightly, or hardly at all so that I wouldn’t mar the beauty of it! Damn you, for being so pretty. Sigh. 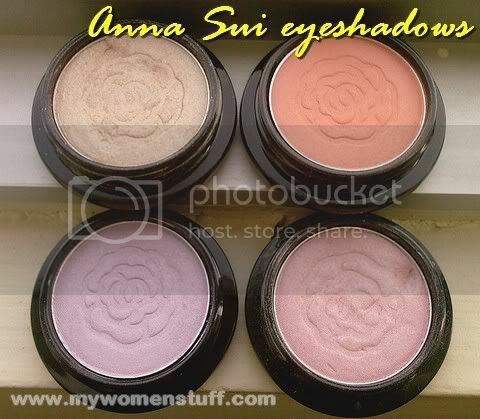 i have anna sui eyeshadows too, i love the purple and pink eyeshadow, and i love the scent! I definitely have to check out Ana Sui! prettybeautiful: The scent irks me a tad but yes their eyeshadows are quite under rated. beautytalk:They are expensive but try getting them online where it might be cheaper.